The sky threatened rain on Saturday morning, October 23, 2004, but that didn’t discourage a large group of folks who gathered on Kenneth and Linda Sells’ farm in the Taylors Crossroads community of Overton County around 10:00 that morning. And in the nearby community of Independence, the cookers were fired up to prepare a meal for this same group of people who would eventually end up there to eat lunch. Although these neighboring communities are only minutes apart if traveling by a vehicle, it took this group over 2 hours to complete this journey. Those participating in this trip did so with mules and wagons or on horseback. More than 20 wagons lined up to make the journey consisting of some 15 miles round trip. There were also several horseback riders in this group. The event, planned and sponsored by Kenneth Sells, Bill Decker, Earl Watkins, and Frankie Beason, had nearly100 people participating. The caravan of wagons took some back roads as part of the journey. Trees and wild flowers that lined the roads displayed beautiful fall colors, even though it was a breezy, cool day. Traveling by wagon at a leisurely pace is great way to see and appreciate the countryside. About half way into the trip, the mules and horses were given a break on one of the back roads. And anyone who needed to take a walk off into the woods could do so as well. In addition to enjoying a wagon ride for the first time, I also realized that a great deal of effort and preparation is involved in putting one of these events together. It isn’t as simple as just getting mules hitched to a wagon and away you go. The parking lot at Food Lion looked quite strange that particular Saturday morning where trucks, trailers filled with mules or horses, and trailers hauling wagons had stopped off on their way to Taylors Crossroads. Some folks traveled from Cookeville, Sparta, and even Albany, Kentucky to join in the wagon ride. Everything is hauled to the location where the ride begins, and then packed up once more after the ride is over. The people involved have to really love it, because there is an awful lot of hard work that has to be done before and after each ride. A wonderful meal prepared by Terry Pritchard and Jackie Pritchard awaited the travelers when the mule train reached Independence. Serving platters piled high with grilled pork shoulder, hamburgers, hot dogs, fried potatoes, potato salad, baked beans, cole slaw, drinks, and yummy desserts were on hand for everyone to enjoy. It was a great day in spite of the threat of rain and cool weather. Those who sponsored the ride are planning to make this ride an annual event. In the meantime, additional rides, some that even take place in other states, are participated in by some members of this group from time to time. My husband and I were invited on the ride by Joan and Bill Decker. 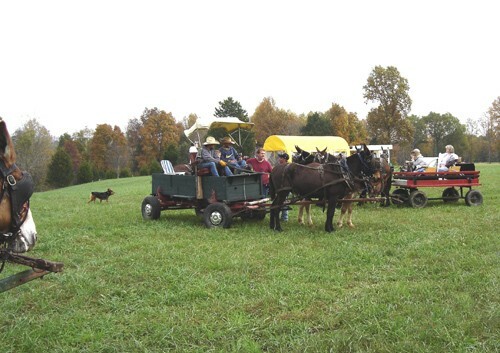 The Decker wagon was handcrafted by Bill, and their two year old mules, Tobe and Riley, did all the hard work to make the ride such a pleasant one. Even rain would not have been a problem for some of the wagon owners on the trip as there were several that had very detailed and attractive covers for the wagons. I think everyone there had a great time, and will be looking forward to the next trip, and especially for the time when Frankie Beason announces ... "Wagons yo!"